This post was made possible by Double Duty Divas and Pampers. I was provided the featured product free of charge to facilitate my review, but all opinions are 100% my own. If you’re reading this, you probably have a baby, know someone that has one, are about to have one, or have had one. (Pretty much covers just about every one right?) With little ones come diapers and contrary to popular belief, not all diapers are made alike. Some leak more than others and leaks are never a good thing when you’re talking about diapers. It’s pretty common knowledge that a dry baby = a happy baby and a happy baby = a happy family. Waking up dry and staying dry means a good day for everyone! When you have an active little one like I do a good diaper is worth it’s weight in gold (wet or dry!). Check out Bella’s morning dance moves! See what I mean about active! 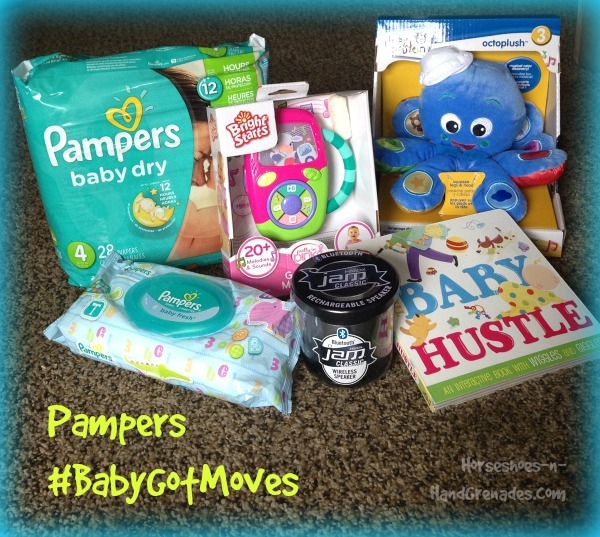 Now Pampers wants all the parents out there to show of your baby’s morning dance routine by uploading videos to Instagram and Facebook using the hashtag #BabyGotMoves. Uploaded videos also have the chance to share in a shareable compilation video created by Pampers! All you have to do is complete as many entries as you want on the entry form below for your chance to pick up this awesome Pampers swag! Fun giveaway. My kids are out of diapers but I can tell you we loved Pampers when they were. Their wipes for sensitive skin were the only ones I bought for my son early on. My boys like fast music when they dance. I would love to win this prize for several friends who are having babies. One is in labor today. My mommy friends LOVE Pampers! My kids love to move to any music, they love it especially if it has a good beat. My daughter loves to dance to the Yo Gabba Gabba theme song! Jumpy-Jump-Jump song from Yo Gabba Gabba is a major favorite to move and groove to for my little one. Can you believe I’ve never seen Yo Gabba Gabba and I’m pretty sure my toddler hasn’t either. Crazy right? My 5yo was completely taken over by Yo Gabba Gabba. It was a hard period to go through, having him begging for me to put “Gabba” on TV all of the time, walking past merchandise in stores, etc. He’s outgrown it now, thank goodness! It’s a great show, but not when it becomes an obsession! My toddler has seen it a few times, but we make sure to make her viewing few and far between. Ahhhhhh, baby days I miss them!! My daughter loves dancing to Let It Go! The Wheels on the Bus — she loves it! Oh my that’s adorable — and really, if the ice cream truck doesn’t make you happy, what will! my little one is only month old so too small to move to the music.. but of course i play and sing rock a bye baby to him. My baby dances in my belly to anything loud enough for her to hear. Lol my daughter likes that one too…she actually copies the dance because her older brother does it! Love to move to all the Wiggles songs. My little girl likes Happy from Despicable Me 2. She loves dancing to the theme song to mickey mouse clubhouse. Snowbound? Make It A Movie Night with Deep Fried Snicker Bites!